Whether you suffer from celiac disease, an autoimmune disease suffered by 1 in every 100 people, or are trying special diets such as paleo or keto, which require lesser carbohydrate consumption, gluten-free foods can be critical to achieving maximum health and are certainly on an upward trend. In Istanbul, there are a number of restaurants devoted to or having adopted this healthy-living lifestyle providing multiple options for those living gluten-free. Istanbul's sole completely gluten-free full service restaurant Glutensiz A'da 216 dishes up breakfast and classics such as su böreği and gözleme, lahmacun, pide, salads, pastas and entrees and has a wide selection of gluten free desserts including profiterole, tiramisu and baklava. The restaurant, located in the Yaylada shopping center in Maltepe also has a wide selection of bakery items available on site as well as for order on their website, www.glutensizada.com where they also sell breads such as hamburger buns and frozen products such as lahmacun, ravioli, mantı and pizza. Makai Vegan & Gluten Free Kitchen is the revelation of actress Müge Boz, who you may recall from the popular and hysterical television adaptation of Leyla and Mecnun, and is a restaurant that opened in September of last year that offers gluten-free dishes for dining and to go and is located in İntema Yaşam in the Kanyon shopping center in Levent. In addition to their vegan burger, there are a number of gluten-free mains and desserts to select from. Wagamama, which revolutionized the Kanyon Shopping Center when it first opened, continues to pioneer its way in promoting Japanese food to all Istanbulites. They offer a specially catered gluten-free menu that includes starters, salads and noodles as well as dessert with a wide array of ice cream and sorbet flavors. Nalia is a restaurant with three locations in Istanbul that showcases cuisine from the Black Sea region and has a selection of appetizing gluten-free offerings such as the famous fondue-like muhlama to cabbage soup, corn bread and a special corn-based dessert. Those going gluten-free will be pleased to know that Etiler Gürme Kasabı dishes up gourmet and gluten-free burgers. The Upper Crust, which is a popular pizza chain located in Beşiktaş and Bebek, has a gluten-free rainbow vegan pizza on offer, while Haçapuri Karadeniz Pidesi has devoted Sunday's to preparing gluten-free pide for patrons. Located in the up-and-coming Sanayi neighborhood, Juice Up has a healthy range of designer sandwiches that are gluten-free such as their avocado, beet hummus, soya cheese and kale sandwiches. Eat Pro Diet, which is located in Bebek, does a full menu for gluten-free patrons that include options such as pancakes, pastas, muffins and cakes. Similarly, Ne Olsa Yersin?, which is located in Akatlar, also has an extensive gluten-free menu on offer, while Diet Club will deliver healthy gluten-free options to your door. With locations in Nişantaşı, Caddebostan and Ataköy, Hardal is a fun and fantastic restaurant chain that serves up scrumptious international fare including three gluten-free pasta options on their menus. Tribeca, another upscale chain that brought bagels to Turkey, also offers a gluten-free pasta, while Kirpi Café, a similarly colorful and comfortably decorated café on Bağdat Caddesi and Koşuyolu, also has a few basic items such as breakfast, toasts and pastas that are gluten-free. There are a number of options in town for gluten-free mantı, including Alamanti in Cihangir, Mr. Dumpling in Kadıköy and Terrace mantı in Fulya. The very nature of soba and rice noodles makes them gluten-free, which makes Istanbul Wok & Sushi an excellent option for your Chinese fix. Meanwhile, Bebek 1001 Çeşit Makarna ve Salata also has healthy and satisfying gluten-free offerings on their menu. When it comes to bread, Istanbulites are in luck as the bakery chain Backhaus has a number of gluten-free loaves and sweet baked goods. Gram in Bebek also sells a paleo bread and a roast beef sandwich on top of it. Hands down the best news for those pursuing a gluten-free lifestyle however is the fact that not only does Mado, Turkey's largest ice cream chain, serve a selection of gluten-free flavors but Karaköy Güllüoğlu, the aficionados in baklava the world over, now make gluten-free variations. Run by Selin Güneş, Glutensiz Fırın offers workshops, catering and a variety of gluten-free products from the website www.glutensizfirin.com. On Saturday, Jan. 20, she will be holding her basic bread making workshop in which she teaches how to prepare four different types of gluten-free breads and then on the following Saturday, Jan. 27 will be a Gluten-Free Italian Cuisine class in which participants will learn how to prepare gluten-free pizzas, calzones, focaccia and tiramisu. The four-person courses are held in Selin's workshop in Bostancı. She can also offer the course in English for parties of four. Or order some of the wonderful breads she has to offer from the website including foccacia, croissants, herbed and plain sandwich bread, simit, Ramadan pides as well as cakes and cookies. In Bodrum, there will also be a Gluten-free Cooking Class held this Thursday, Jan. 18 at Maksimum Yaşam. 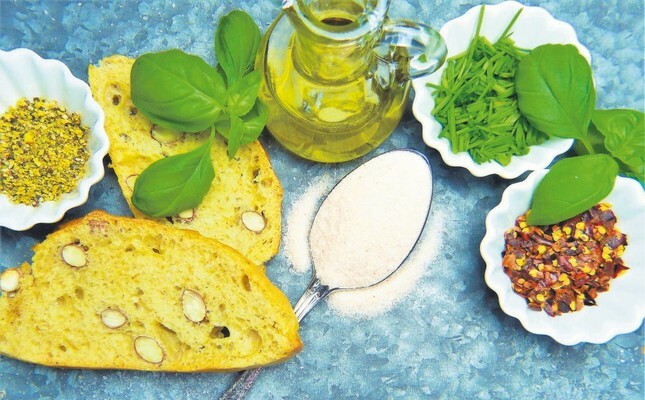 Participants will learn how to make bread, lavash and biscotti in this two-hour course starting at 6:30 p.m. and led by Pelin Dumanlı, who will be accompanied by dietitian Büşra Pehlivan and specialist Dr. Halil Ertürk.